Don’t own a water bottle? Many organizations give out free water bottles at local fairs and events. Choose low-fat or fat-free dairy options. For dairy alternatives, be sure to pick a variety that does not have added sugar or is labeled “unsweetened”. Skip the sugar-sweetened beverages (soda, juice drinks, energy drinks, sports drinks). They offer you and your family nothing for nutrition that cannot be found in more healthful options. Coffee and teas can be a source of added sugars. Skip the pre-made drinks and brew your own at home. It is cheaper and you can control how much creamer and sweetener you put in. Do you have a beverage habit? Try to cut by using this tip: Mix half your regular beverage option such as soda or juice with seltzer, club soda, or plain water. Over time, mix less soda and more seltzer/water into your beverages. Choose breads that are made with 100% whole grains or 100% whole wheat. Brown and multi-grain breads don’t necessarily contain whole grains. Check the serving size – is ¾ cup really how much you would eat? Remember, you can always add sweetener such as a tablespoon of dried fruit or a teaspoon of honey or maple syrup drizzled over the cereal. Buy what is in season. Not sure? Check out this great chart for Maine! Looking for the freshest? Check out your local farmers’ markets. Don’t be afraid to break up the bunch. Just because bananas come attached together doesn’t mean you have to buy the whole bunch. Only buy what you need. If you are buying grapes or cherries, don’t be shy, only take what you want rather than the whole pre-packaged bag. 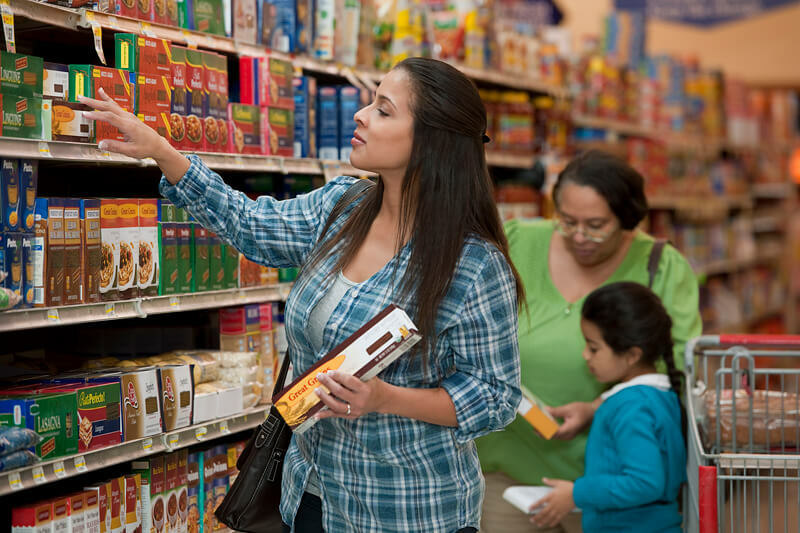 Choose low-sodium or “no-salt added” canned vegetables when available. Drain and rinse well. Add flavor by using herbs and spices. Look for low-cost herbs and spices at discount dollar stores. Choose low-sodium or “no-salt added” canned beans when available. Drain and rinse well. Tip: pick up plain yogurt and add your own toppings like a teaspoon of your favorite jam, a drizzle of honey, or some frozen fruit! Tip: buy a large container of yogurt and make your own single serving, it is cheaper! Skip the smaller packaged yogurts and opt for the large container. It only takes a few seconds to scoop out a serving of yogurt and you’ll save money too! Check out our unit price comparison of a 6oz yogurt compared to a 32 oz container of yogurt. Dry milk is great because you don’t need to refrigerate it. Keep it on hand for when you run out of milk for cereal, add it to hot cereal or smoothies for added protein. It can be expensive because you have to buy so much all at once. One box has 32 servings in it roughly about $0.30 per serving. You can split a box with a friend and split the cost. This is also an alternative to stopping at the local convenience store to purchase milk where you might pay up to $1 more per gallon than at the grocery store. Buy the biggest container of frozen whole fruit with no added sugar, or toppings and frozen vegetables with no added sauces. This will be your cheapest option as frozen produce lasts up to 6 months! Cut back on portion sizes! Remember a serving size of meat is only the size of a deck of cards. Eating less meat will save you more money! Skip the prepackaged lunch meat. You might have to wait in line at the deli but you’ll skip the cost of the prepackage convenience and only be buying what you need. Lentils – there are so many varieties of lentils but the most common are green and red lentils. Lentils are great because they will last a long time in your pantry – just don’t forget about them. You can find lentils in the same aisle as dried and canned beans. A serving of beef can be as much as $1.49 where a serving of lentils is $0.10. Beans - If you’re looking for a way to stretch your budget and improve your family’s nutrition, consider adding more beans to your menu. They’re convenient, versatile and lend themselves to many tasty dishes. Beans are a rich source of protein, fiber, vitamins and minerals. Beans can be added to casseroles or soups to add flavor, texture and more nutrients.